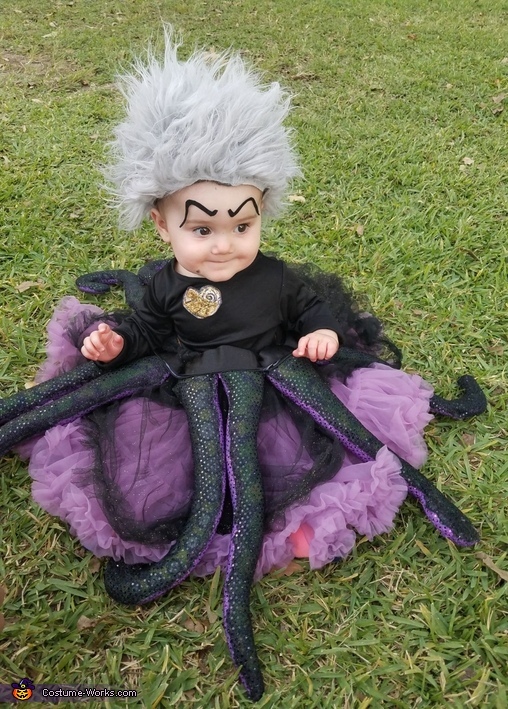 This homemade costume for babies entered our 2017 Halloween Costume Contest, and won 3rd place in the Cutest Baby Costume nomination! With the help of a good friend, a witch dress, my little brother's octopus plush and a visit to hobby lobby, I am very happy with the turnout of the costume. It took a day to make it and only cost about $20! The black witch costume and tutu from goodwill, fabric for the tentacles and black felt for the eyebrows from hobby lobby, I already had a furry pillow and tights to make the wig and my sweet lil bro let me dismember his favorite octopus plush (I will replace haha). I'm sorry I didn't take pictures of step by step process! Anyway, hope y'all enjoy my baby's first halloween pictures!